Jules (Drayton, United Kingdom) on 3 March 2013 in Miscellaneous and Portfolio. M42 - The Orion Nebula is seen as the middle "star" in the sword of Orion, which are the three stars located south of Orion's Belt. The star is one of the brightest nebulae and appears fuzzy to a naked eye observer - even in areas with some light pollution. M42 is located at a distance of 1,344 ± 20 light years and is the closest region of massive star formation to Earth. The nebula is estimated to be 24 light years across and it has a mass of about 2000 times the mass of our Sun. 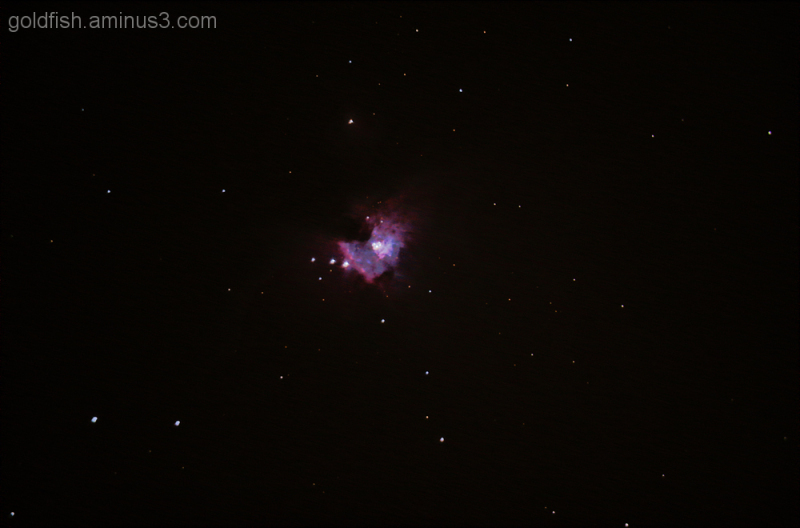 This is my first ever attempt to photograph a "Deep-Sky Object" using the Celestron C6-A XLT leant to me by a friend. Taken from my back garden it is a composed of over 50 individual photos stacked together. Each photo has a 6 second exposure at 1250 ISO. What blows my mind is when the photons of light captured by my camera left the nebula and started their long journey towards Earth, Britain was occupied by the Vikings and Anglo Saxons. Fantastic Jules !!!! Awesome amazing shot !!! Oh my word, that's about 5 minutes worth of exposures and heaven knows how long to stack them all together, you have a lot of patience Chris! The end result is certainly worth the effort, I think I would have been pretty excited making this one on the PC. @Curly: As it was my first foray into astrophotography I was very chuffed with the results - I spent another session last night and will post the resulting frame soon - (there is a massive difference between the two). Lots of tweaking and fiddling still to be done to get to grips and to learn the ropes with this area of photography. Sorry Jules, how on earth did I call you Chris? Incredible and fascinating shot Jules. I would love to do so. Breathtaking. brilliant, jules, and quite a lot of effort you had to put in! i've NEVER managed to get a decent shot of the night sky, or even the moon, though i've been trying. @franz: What boggles my mind is due to the "theory of relativity", time cannot exist for a photon travelling at the speed of light. So regardless of whether it travels the eight minutes or so from our sun or the 13.2 billion light years from the distant galaxy Abell 1835 IR1916, when they hit our retinas or CCD's the photons existance is simply that of "Go/Splat" i.e. it is created and in the very same instance it is annihilated. Wow you must be very proud of this shot, I have always wanted to try this. 5* vote from me I hope this makes a spotlight. 5 stars from me - this is amazing! fine result for your fist attempt! i imagine that the technique required for this kind of photography is quite difficult and you have taken excellent first steps here! First time? wow... great success here.. amazing what you can see from your own home. I know little about telescopes but it must be a bloody good one. I missed this one !!!!!! and I share your feelings in your last sentence.